Who must buy Avanti 12 bottle wine cooler? 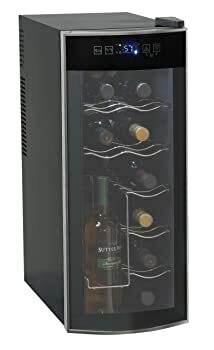 With over forty years of experience in Appliance Industry, Avanti has built its reputation in delivering quality products at amazing prices, and Avanti 12 Bottle Thermo-electric Counter Top Wine Cooler – Model EWC1201 is no exception. With contemporary style and a compact design, Avanti EWC1201 has become a wine-lovers’ choice over the years. If you want to store expensive wine bottles at a stable and suitable temperature with controlled humidity without any issue related to water pooling, then wine cooler like Avanti 12 bottle thermoelectric counter top wine cooler comes to your rescue. Avanti Wine Cooler EWC1201 has been getting positive reviews on a consistent basis since it has been introduced in the market. Its versatile features and stunning black looks with curved glass door, makes it a favorite wine cooler both as online and offline shopping options. Out of twelve bottles it can store, 8 can be held in horizontal position and remaining four can be placed in vertical position. Maintains taste: Wines, if not stored at consistent temperatures and humidity, tend to change taste. With Avanti 12 bottle wine cooler, you can stay relaxed that the fresh flavor of your favorite wines is maintained. All credit goes to its thermostat installed in cooler which works 24×7 to maintain the set temperatures. Shelf Customization: Sometimes you have to stash in some large bottles in the cooler. Avanti Wine Cooler EWC1201 comes with an amazing feature of removable shelves allowing you to customize according to your needs. With the space for keeping up to 4 bottles in vertical position, you have now option to cool even partially used and opened bottles. Brilliant feature, isn’t it? Cooler Size and capacity: The storage capacity of this wonderful wine-cooler from Avanti is 12 bottles. The width of cooler is reduced to save the space and it fits well in kitchen or any other area by taking the minimal space possible. Quite Operation: While working on the cooling of your favorite wine bottles, this cooler does not make any noise and you can sleep undisturbed. The Bottle dregs are not troubled because there is no vibration in the cooler at all. Stunning looks: “Have you fallen in love at first sight?” If not, then this black beauty from Avanti will surely make you fall in love with it, at first sight. Black Body with Platinum toned finish can complement and enhance the looks of any superior décors around. Touch Screen Panel: The control panel of Avanti Wine Cooler EWC1201 can be handled by a novice too, since it is very easy to operate. The Touch Screen Panel is illuminated with back-Lid light and gets off automatically after a few seconds, if not in use. The digital temperature display allows you to change the units of temperature as Celsius or Fahrenheit. Pocket-Friendly: Although it is not a dual zone model allowing you to separately cool red and white wine, but the price tag with which it comes is quite attractive and affordable. This wine-cooler from Avanti is suitable for wine-enthusiasts who have limited space in kitchen or living room since this wine cooler is built in slim shape and body. The compact size and modular finish makes it a perfect gift for wedding or Christmas. The wine-lovers who need perfect taste should go for this unique wine cooler since it gives you the option of keeping the bottles in vertical position which allows the sediments of bottle to settle down since some exquisite wines need the bottles to be kept in standing position for a day before consuming. Avanti’s engineering team has designed this wine cooler EWC1201 keeping in view the demands of wine-lovers. The innovative design can be clearly gauged from the way they have designed the shelves, allowing the users to adjust them as per their needs. The greatest asset, Avanti 12 bottle wine cooler has got is that wine-lovers can keep opened bottles in cooler. The EWC1201 cooler’s ability to provide stable temperatures assures that wine lovers’ mania for great taste is not compromised. Avanti EWC1201 works on thermo electric technology rather than compressor technology due to which the manufacturer were able to design the cooler with compact body and elegant looks. The thermo-electric cooler’s temperature depends on the ambient temperature around it. So it is advisable to keep the area around cooler warm in winters and cool in hot summers. Thermoelectric works on the principle of evacuating the heat from inside the cooler rather than blowing cool air inside, which is the usual feature of compressor based refrigerator. Thermoelectric based coolers are light in weight and offer vibration-less operation making them really smart coolers. Most of customers, the average rating is 4 stars. Here is our recommendation for this stunning wine cooler. Avanti 12 bottle thermoelectric counter top wine cooler is very easy to install. It is simple Plug-n-Use machine to install but the only thing you have to keep in mind while installing is it to keep 5 to 6 inches clearing on two sides and back for proper air circulation and ventilation. The ECW1201 wine cooler comes with 1 year limited warranty and is returnable in 90 days. As an owner of this classy Avanti 12 bottle wine cooler you can boast of its stylish looks and impressive performance. This single zone, compact wine cooler is rich in features yet light on pocket. With this super cool wine cooler you will never have a dull party. Your friends will love to party with you and whenever you want to enjoy some solitary moments with someone special, you can make the moments very exceptional with wine chilled to perfection. So why to wait any longer, get this reasonably priced and good looking compact wine cellar to make all your family get together, more enjoyable. Go back to Wine Cooler Reviews Page to read more product reviews and comparison on Zentiz.